I am sure you all enjoying the Sunday very well, I am again with a boring Sunday. So I wanna make this Sunday something interesting. I was watching Fall Look makeup videos for 2 months whenever I want to do something new. The Makeup Gurus are amazing and I know I can't even imagine to do the makeup look what they are doing. I always simplify the things and do it easily. 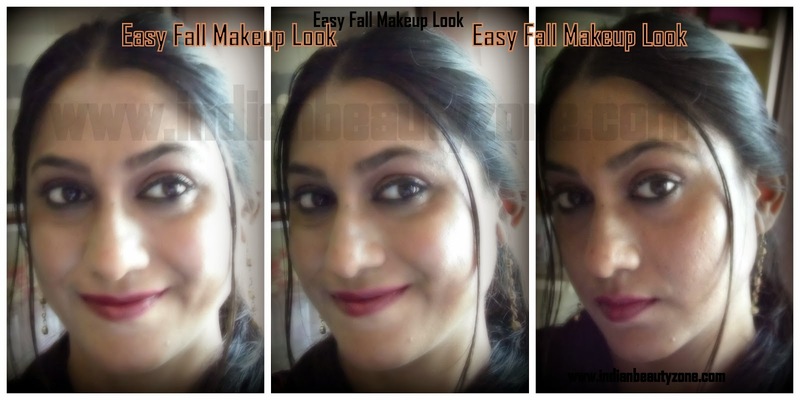 So, I gathered a general idea about Fall Makeup look that 1. Neutral Eye makeup with dark lip colour or Smokey Eye look with neutral Lips. We should relate the shades with Fall trend somehow. So I did Easy Fall Makeup Look with Shimmer Neutral Eyes with Cranberry Lips. I am allergic to use so many makeup stuffs and layer it on my face. So, I used minimal products for this look. I applied foundation by my fingers and blended it on my skin well, then I did set it with Lakme Compact powder. Now My Face is ready for fall Makeup and I did bit bright look here. 2. Streetwear Creamy eyeshadow Bomb shell and Miss claire Neutral shade eyeshadow . 5. Eyeshadow brushes and eye pencil for eyebrow filling. First time I did eyebrow filling in my life. I used AD pencil for this purpose and this pencil did the job very well. Then I started applying the Miss claire eyeshadow as base and then applied Streetwear eyeshadow to give a neutral shimmery look. Then applied streetwear eyeliner on the lids and lakme eyeconic kajal on the water line. That's all Neutral eye look ready. For the lips I have used Lakme eyeconic kajal and maybelline super stay 10hr tint colour which is sent by Teju darling <3. I don't have any cranberry shade in lipsticks, so first I lined my lips then smudged it inside the lips slightly. 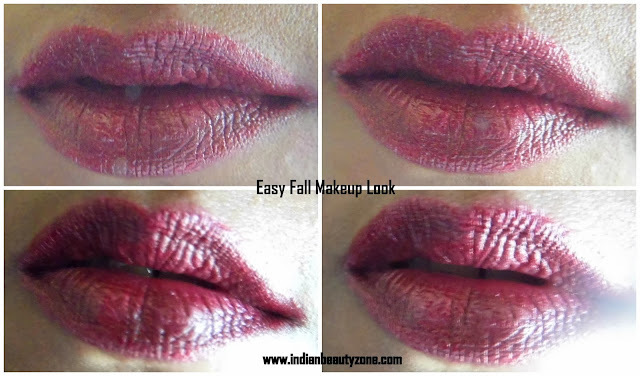 The I have applied the Maybelline colour tint and created this fall lip look. PS: I am very bad in taking pictures of my makeup looks. Somewhat I have managed and took this pictures today. Excuse me if you find any mistake here. I took the pictures really in a hurry before my naughty son wake up. Hope to do the smoky Eye makeup with Neutral lip colour soon.